Last weekend, we have put up an solidarity graffiti of eighty meters long opposite the police headquarters and training center of The Hague, the Netherlands with the text: Burn all prisons. The graffiti is in solidarity with Lisa and Peike who are both in German prisons. Lisa is imprisoned for seven and a half years because of a conviction on suspicion of bank robbery. Peike has been sentenced for two years and seven months because of protests against the G20 summit in Hamburg. We want them free! Freedom for Lisa and Peike and all anarchist prisoners! Burn all prisons! Yesterday (30-9-2017) a manifestation took place in Amsterdam in solidarity with comrades who are momentarily in prison after the G20 protests in Hamburg (Germany) this July. After the manifestation a spontaneous demonstration started through the inner city of Amsterdam. 100 people took part in the manifestation in solidarity with G20 prisoners. There were speeches and music acts. After the manifestation about 50 people walked an unannounced demonstration through the centre of Amsterdam to Spuiplein. Freedom for all G20 prisoners! Freedom for Peike! Letter from anarchist prisoner Marcelo Villarroel Sepúlveda – Chile. Essa publicação reúne algumas ofensivas anárquicas dentro e fora das cadeias, contra a desprezível reunião dos vinte chefes de estado mais poderosos do mundo. A energia caótica mantém a chama da anarquia queimando. As ações transcritas nessas linhas são recebidas por nós calorosamente. Todavia estas práticas não se encerram apenas na nossa memória, mas encontram solo fértil em nossas mentes e corações. Portanto não se trata de contemplar o passado, mas vivê-lo intensamente durante o presente. A visão transmitida é bastante nítida: nós não esperaremos pela próxima cúpula. 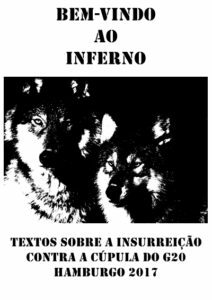 Essa publicação celebra a rebelião, procurando manter pulsante a paixão demolidora pela total liberdade. From Amsterdam to Hamburg. On Thursday 31st August a solidarity demo took place in Amsterdam. It was not only against the G20 but also against the recent censorship of Indymedia in Germany. We hope you can spread the news amongst our friends. During the days of the summit of the G20, thousands of people flooded the streets of Hamburg with their anger about the cops` violence and the world that they protect. Already during the week before, there was no uncertainty around the cops’ will to confront every sign of protest or resistance with zero tolerance. During the demo on Thursday evening, they made their position clear once again, attacking the front of the demo from the first minute it started. The cops obviously and viciously embraced the possibility of potentially even lethal injuries, when they pushed and kettled the front block of the demo into a very narrow, canyon-like part of the Hafenstraße, bordered on the sides by brick walls. They caused panic, hitting, kicking, pepper-spraying, firing tear gas and shooting water canons from the front and the sides. Many people sought to flee over the walls on the sides, a lot of people got hurt – but you could also see impressive moments of solidarity, people helping each other up the wall, whilst others attacked the cops from above and brave and calm front rows defended the demo from the cops attacks, taking a serious beating.